It is said that “not being in Cai Rang floating market means not knowing the land of Tay Do – an old name of Can Tho”. Cai Rang floating market, one of the famous floating markets of the Southwest, specializes in selling fruits and agricultural products of the whole region. 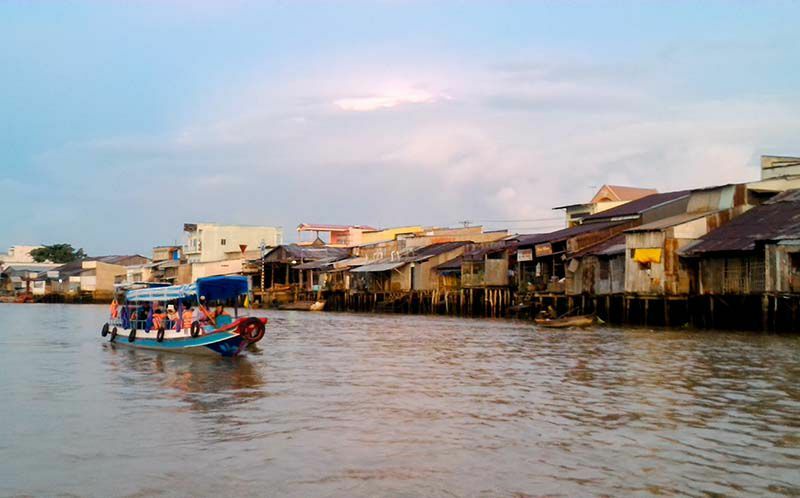 For tourists who travel to Can Tho, metropolis of the south-west, it would be regretful if they could not drop by and purchase something in Cai Rang (6km from Can Tho city), one of the most famous and biggest floating markets in the Mekong Delta. Located on Cai Rang River, this floating market is 6km away from the center of Can Tho City (the capital of the Mekong Delta), a so famous name to most tourists when traveling to Vietnam. To reach there, it takes about 30-minutes away from Ninh Kieu Wharf by boat or 15 minutes to take a taxi or drive a motorbike to the Cai Rang pier. 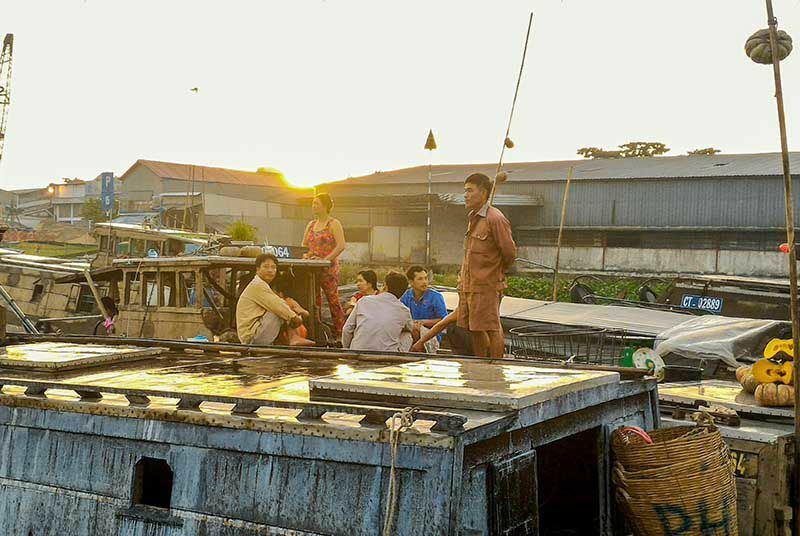 The same as other floating markets in the Mekong Delta (eg: Phong Dien floating market, Cai Be floating market, My Tho floating market), Cai Rang was initially formed to meet the trading needs of the locals while the road traffic system was still in its infancy. What’s awesome is that it’s existed for over a 100 years! Today, even if the road traffic network has developed significantly, Cai Rang floating market keeps growing and brings value to the locals of the country and area in terms of economy, culture, and tourism. Due to the tropical climate of Vietnam, we have two major season in the south – the dry season, from December to April, and the rainy season from May to November. You can visit Cai Rang at any time of the year but if you want to be more relaxing, raining time would be suitable for you as it will be much cooler. However, visiting in the dry season would give you a chance to try almost all types of fruits that are available. You would be amazed the first time you come here in an early morning by its extremely lively and crowd trading atmosphere. Stare in awe when you see the smooth performances of traders juggling fruits boat to boat. Interestingly, in the middle of such a bustling trading scene, you will still somehow find strangely comfortable moments while immersing in the rustic lifestyle of the Vietnamese and breathing in the cool breeze of the great river. Playing as one of the main trading centers of the Mekong Delta and being the largest floating market in the region of Mekong Delta, Cai Rang is a place where the locals sell and buy a wide range of products catering to their daily lives. Besides staple commodities, this is a famous location to find local products priced quite reasonably. They may be the freshest fruits harvested from the farm like durian, milk fruit, rambutan, mangosteen, grapefruit, etc., or even other processed specialties, such as fish sauce, coconut candy, or dried fishes. Come here and worry no more about what to bring home. It is also a wonderful experience for you to enjoy local food even when you are on a boat! Pho, Hu Tieu, Com Tam or Bun Rieu are usually served in many floating restaurant or ‘’food boat’’. Only with 25,000 or 30,000 VND (~ 1 dollar) can you taste the traditional Viet food! 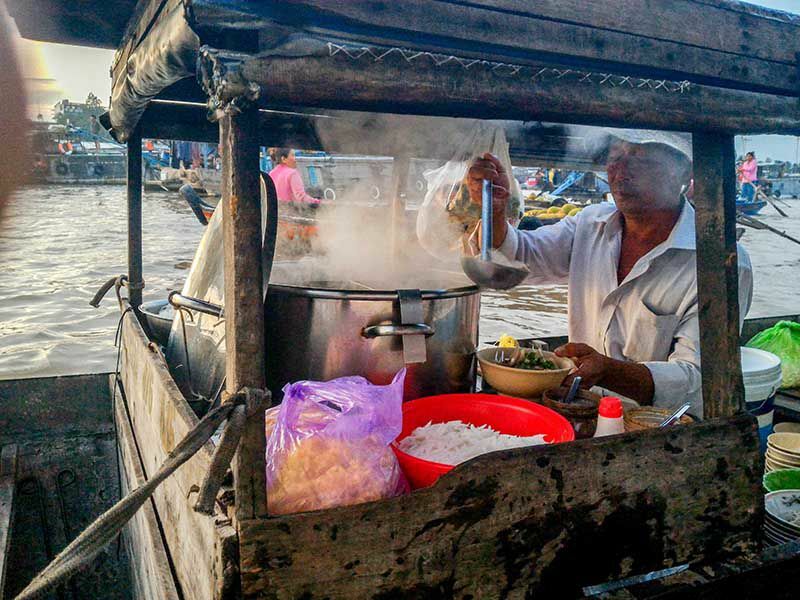 Enjoying the glamorous and charming sunrise in an exciting floating market with hands holding a bowl of Vietnamese dish, that’s all enough to you for an amazing day, isn’t it? 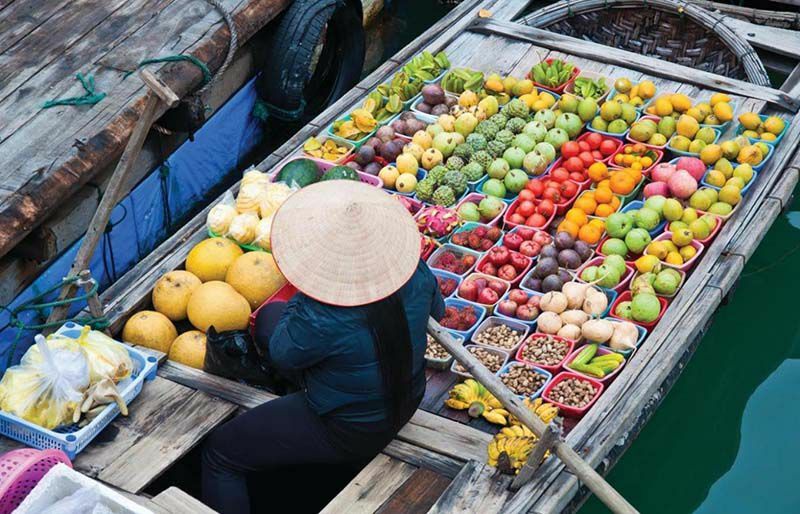 Despite the development of those supermarkets and modern shopping center on land recently, Cai Rang Market and other floating markets in the southwest of Vietnam still hold an important role in people’s life and remain a special beauty that cannot be compared to any other regions. Only when going you will discover how wonderful and awesome it is!